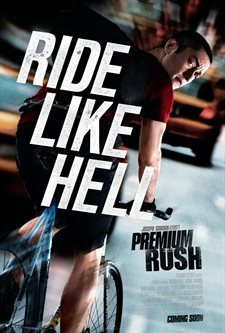 Download Premium Rush in Digital HD from the iTunes store. 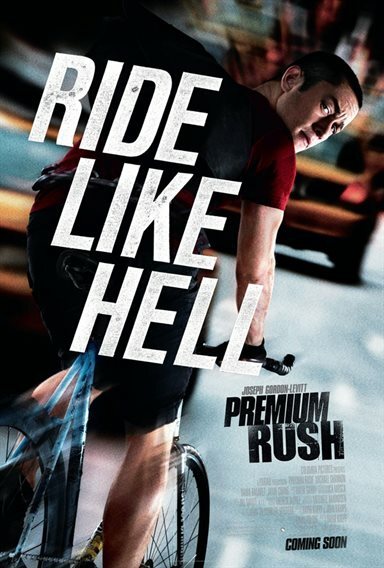 Premium Rush images are © Sony Pictures. All Rights Reserved. Action junkies beware the movie Premium Rush streaks into theaters this weekend and it's a sweet adrenaline rush. The film features some excellent shots of New York City through the eyes of a rapid camera that draws focus on all the heart pumping drama. The fine acting and directing make this hour and a half body in motion film work. The film centers on Wilee (Joseph Gordon-Levitt), a daring bike jockey who works for a delivery service in Manhattan. Avoiding reckless New York City drivers and taking a lot of chances in traffic, his goal of hand delivering the message is his only end game. He's a fearless, street smart, crafty and amazing bicyclist. Not his true profession, he has taken time off from Law School to find himself, Wilee takes any delivery he can get to survive living in the big city. On one occasion Wilee gets assigned a late messenger job that needs a high rush. Since there's extra money in it for him Willee accepts the assignment to make a pick-up from a Chinese girl named Nima (Jamie Chung) and deliver it to Chinatown before a 7 pm deadline. He gets to the pick-up location and Nima gives him an envelope that she says can only be delivered to the person listed on the letter. On his way back to his bicycle he gets stopped by Bobby Monday (Michael Shannon) an agitated guy who orders Wilee to give him the envelope. He tells Monday that it's not possible and the man gets upset. When Wilee quickly takes off for his destination, a life or death chase ensues. Bike versus car, the movie takes the viewer on a rollercoaster ride through the city. Making sure that the audience gets full high-energy effects Director David Koepp (Secret Window) mounts his camera on cars, bicycles, street corners and buildings in the crowded city. Avoiding near misses, crashes, confrontations and pedestrians are part of the job and Koepp makes sure you get a lot of close encounters while his actors and stunt guys speed around the city. The acting by Gordon-Levitt and Shannon as the two that go head-to-head is amazingly good. Shannon makes an awesome bad guy trying to catch Wilee before he gets to his destination. He tries every trick in the book from chasing him down with his car to working him over in a physical confrontation. He's determined to get the message and Shannon makes his character very believable. Gordon-Levitt on the other hand keeps outwitting Monday with the help of his sometimes girlfriend Vanessa, ably played by Dania Ramirez. Riding in and out of traffic, through Central Park, into parking garages and sliding out of sight any chance he can get, Wilee shows his determination and ability to persevere under the most dangerous of circumstances. Very striking cinematography makes the scenes exciting and realistic bringing the ‘wow' factor to the film. In scenes where Wilee must decide how to avoid an accident, the camera shows different routes and their affect on the cyclist's decision. The motion capture is very cool and the wrong cyclist decisions have cringing affects. Wide-open lenses, crane shots and hand held cameras get the viewer into all the wild action. The film has been rated PG-13 for some violence, intense action sequences and language. The action gets very forceful so be aware if deciding to bring youngster tagalongs. Premium Rush images © Sony Pictures. All Rights Reserved.